I am a Registered and Board Certified Art Therapist, providing art therapy services in the Washington, DC metro area. I hope to open my own private practice soon. 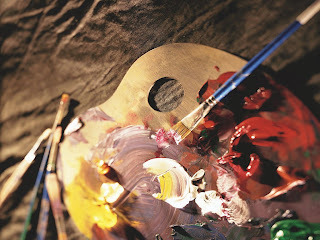 Art therapy is a mental health profession that uses the creative process of art making to improve and enhance the physical, mental and emotional well-being of individuals of all ages. It is based on the belief that the creative process involved in artistic self-expression helps people to resolve conflicts and problems, develop interpersonal skills, manage behavior, reduce stress, increase self-esteem and self-awareness, and achieve insight. I decided in junior high that I wanted to be a psychologist. After I learned about the use of art with schizophrenics in my high school psychology class, I realized that my desire to be a psychologist and my artistic hobby could be used together in helping people. I attended Oklahoma State University for my undergraduate degree, where I graduated with my Bachelor of Arts in Psychology with a Studio Art minor. From there, I attended George Washington University, where I gained experience in placements in a special educational school setting and a day treatment program for trauma survivors, and then graduated with my Master of Arts in Art Therapy. My subsequent experience includes working with children, adolescents, and families as an art therapist in home-based counseling, with emotionally disturbed adolescents and pre-school age children in DC inner city schools, and with adolescents of active duty or retired military in a day treatment hospital program. I have also had experience working with soldiers in the Warrior in Transition Unit. In addition to my work experience, I have also been a graduate faculty on-site supervisor of graduate interns since 2006. I am a registered, board certified, and licensed art therapist in the DC Metro area, working in the field since 1999. I currently work with adolescents in partial hospitalization and inpatient clinics as well as in private practice. In addition, I provide supervision to graduate interns as well as ATR or LCPAT candidates for their registration or licensure. I am the author of "Color Me Calm," "Color Me Happy," "Color Me Stress-Free, "Color Me Fearless," "Color Me to Sleep," "Color Me Grateful," and "Mom and Me: An Art Journal to Share, Create, and Connect Side-by-Side." I have released a double album of guided imagery for relaxation with original music, entitled "Lavender Dreams."